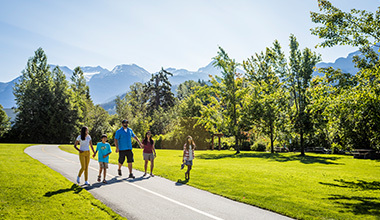 Stretching 40 km through Whistler’s valley, the Valley Trail connects all neighborhoodswith a paved, accessible and scenic path that’s perfect for biking and sightseeing. 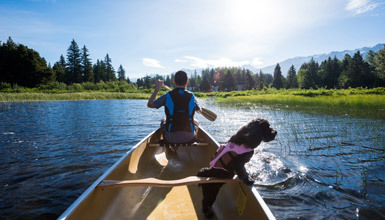 With five alpine lakes and numerous parks all within pedaling distance of the Village, the Valley Trail provides days of entertainment and allows you to pedal, paddle and picnic all summer long. Learn more about the Valley Trail and see suggested cycling routes. The latest biking craze, fat bikes are rigid frames with wider than normal tires that run at very low pressures. They are suitable for cruising the Valley Trail in summer, but they really shine when the snow falls. Many locals use them in winter to ride on the snow along the Valley Trail and at Whistler Olympic Park (restrictons apply - this is a multi-use area). Electric bicycles are a popular ways to see the Village. E-bikes are equipped with a battery pack and motor for assistance with pedaling. The extra power means people can pedal further and see more in any given day. E-bike rentals and tours are available in the Village. 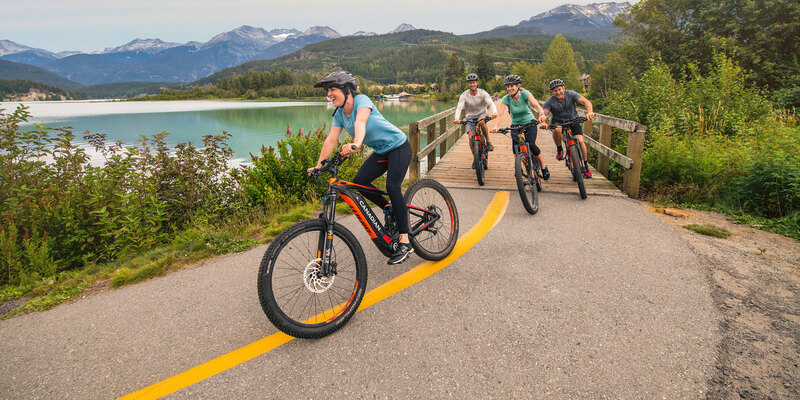 Please note e-bikes are not allowed on cross country trails in Whistler that are maintained by Whistlers Off Road Cycling Association (WORCA). With a more upright position than a traditional mountain or hybrid bike, cruisers provide a comfortable way to pedal the relatively flat sections of the Valley trail. They often come with a basket or rack, which enables easy transportation of picnic items, towels and more. Cruisers can be rented in the Village. A chariot can be hooked up to a bike to allow easy transportation of smaller children (and picnic gear). Chariots are also available to hire. 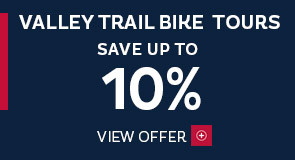 Receive 10% off guided Valley Trail Bike Tours. Book by May 31, 2019. 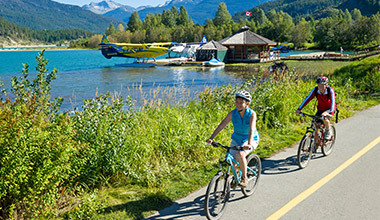 Enjoy scenic Whistler by mountain bike. Learn about the history, geography and key nature spots with a qualified guide. From beginner to intermediate, tours are catered to your skill level. Mountain bike and helmet included in all bike tours. 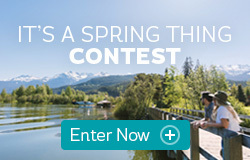 These bikes are suitable for taking leisurely rides along the Valley Trail or for exploring Whistler’s great beginner and intermediate singletrack. Not for use in the Whistler Mountain Bike Park. It's the best way to get around town by far on foot or by bike. The Insider has the top spots to check out next time you are in town.